The benefits business ownership are intriguing–you get to be your own boss, make your own hours, work on something you truly love. Plus, no more worrying about having your hours cut or getting fired. One of the biggest obstacles facing would-be entrepreneurs is finding the funds to get started. The average cost to start a business varies widely. The SBA says it will cost you around $3000 start a microbusiness, while AARP reported the average cost for starting a business is $30,000. That level of investment simply isn’t possible for most people. Here’s the secret: You don’t need much money to launch your own business. If you are willing to invest time, you can start a small business for around (or even under) a $100. Here’s how. There are dozens of different types of businesses you could start. And, to be clear, you can’t start any business for under a hundred bucks. Even so, plenty of options can be exercised if you don’t have thousands of dollars. Think about what you enjoy doing, what skills you have, and what type of equipment you already have around. For example, if you already have a Cricut die-cutting machine then you could easily start a custom line of clothing, tumblers, and car stickers. Do you have a lap top and have a little experience running social media campaigns? A social media consulting or management company might be perfect for you. You might also find inspiration by solving your own challenges. Video: When coming up with a business idea, Gary Vaynerchuck, entrepreneur, advises starting small and solving problems in your own environment. Once you decide on what type of business you want to start, the next step to getting your business started is to research the market and start planning. Market research involves gathering data and information about the market you want to enter, including who your customers are, who your competitors are, and the location and needs of your potential customers. Here is a step-by-step guide to doing market research for very cheap or free. What do they like/dislike about the current offerings? What problems are not currently being solved? What are they willing to pay for a solution to their problem? So how do you get this information? You likely don’t have money to do focus groups, so concentrate on online methods. You can host a free survey through Google Forms. Just make sure to ask qualifying questions to ensure they are in your target audience. You can reject the answers of people not in your target audience. Consider offering an Amazon gift certificate or similar prize to encourage people to fill out your survey. Added Bonus: Request email addresses and ask if they would like to sign up for your business newsletter. Here is a guide on email marketing, including a list of popular platforms. Some offer free plans. This can all be done online for free. At the end, you will have a clear idea of what the market looks like and how your business can stand out. What Is Your Unique Value Proposition (UVP)? In the section above, we talked about looking at customer complaints. This is essential because it helps you figure out where you can stand out. 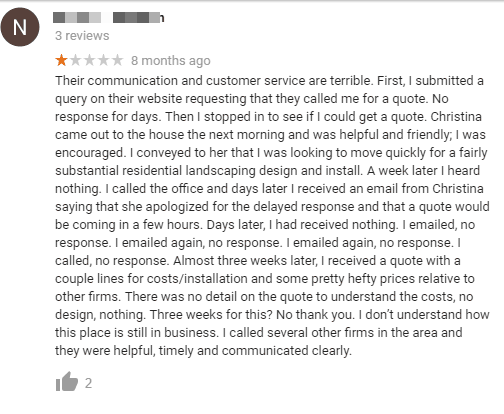 Based on these reviews, I can see that lawn care customers value communication and reliability. 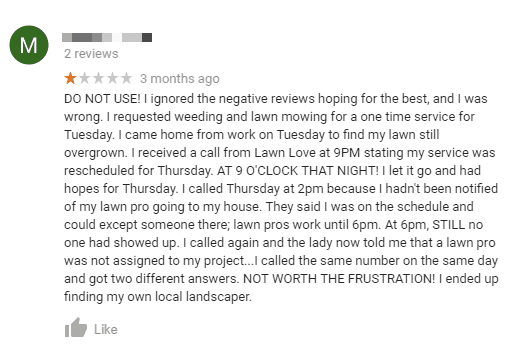 If you were starting your own lawn care business, you could focus on those aspects as the unique value proposition, also know as unique selling proposition (USP). Small businesses are encouraged to focus on their USP when marketing themselves. Video:Lauren Yothers, from Accion, and Rachel Greenwald from Etsy, provide practical examples of how a small business can focus on quality and customer service as part of its USP. Learn more about how to write your USP here. Your next step is to start writing your business plan. A business plan serves as a clear, concise roadmap for your business. Taking the time to write all this down will give you a clearer view of the future. Start by reading other business plans. This will give you an idea of what information you should include and may raise some issues you hadn’t thought of. Ready to get started? Use our free one-page business guide or read our in-depth business plan guide for a full walk-through. Starting a business on a shoestring budget means leaving no funding stone unturned. With extra funds, you can hire additional staff, get better equipment, market your business more successfully, or even scale up faster. Here is the good news–just because you don’t have cash doesn’t mean you can’t fund your business. There are thousands of grants from private and public sources that can help you build your business. Not sure where to start looking for funding? Here are 7 places you might be able to find funding for your small business. Small Business Financing: Which Grants & Loans are Available for You? Small business owners have several options when it comes to legal set up. This section will demystify the different business structures and help you choose the right path for your business. If you are planning to do business under any name other than your legal name, you will need to register your business. There are two options for filing your business name. You can file a DBA (doing business as) or create a business structure, such as an LLC. If you file an LLC, you will register your name as part of the process. Choose a business name. You can use business name generators to find a unique name. Research your name to make sure it isn’t taken. Start with Google, then check with your local county clerk’s office to see if anyone else is using that name. Next, file a DBA with your state government. The process will vary by state, so start by researching the requirements in your area. Our DBA resource will help you figure out how to file a DBA in your area. Or, use a paid service such as Legal Zoom. If you are trying to stay under the $100 threshold, you may need to navigate this process on your own. It is important to note that many businesses do NOT file an LLC or incorporate early on and simply operate as self-employed. This can make filing taxes simpler (depending upon your business) and helps limit unnecessary costs prior to becoming profitable. Here are the different types of business structure and their benefits and draw backs. If you are the only worker at the business, you can choose to work simply as self employed. In most cases you do not need to file any paper work, you simply track your income and report it on your taxes at the end of the year. You will need to pay estimated taxes throughout the year to the federal government. Make sure to research to see if you need to pay estimated state taxes as well. A drawback to being self-employed is your personal assets are not protected if your business gets sued. In a sole proprietorship, your business is not a legal entity. Which means your business’s debt is your debt. An LLC or limited liability corporation is the simplest way to incorporate your business. It is designed to protect your personal assets in case your business is sued, offers tax benefits, and helps your business look legitimate. For most businesses, an LLC offers a perfect balance of benefits and protections without requiring an overwhelming amount of paperwork. Learn how to file an LLC here. Incfile will help you file your LLC for just $49 plus state fees. If you have no other start-up costs, you can still get your business off the ground for under $100. Corporation: Complex business structure that must comply with a wide range of taxes and regulations. The business is a separate legal entity from the owners. S corp: A type of corporation which allows profit and losses to be filed through personal tax returns. Specific regulations must be adhered to, including a limit on the number of stockholders. Partnership: A simple way to structure a business for two or more people, where each partner reports net profit or loss on their own taxes. To learn more about the tax implications of the different types of businesses, view this IRS resource on business structures. Depending upon your location and type of business, there may be other legal considerations to keep in mind. For example, if you have a storefront, you will likely need commercial liability insurance. This resource from the SBA will help you find out if there are other licenses or permits you need based on both your location and your industry. You’ve figured out what type of business you are going to start, you have a handle on the legalities; now where are you going to work? You could work out of your home. If you have the space at home, this can be the most cost-effective place to work. A desk in your bedroom, a spare room, or even the kitchen counter can function as your workplace. Where Else Could You Work? What if you can’t work at home? You can choose communal working spaces, but those cost money. What is a business owner on a budget to do? Here are a few places to work for cheap or free. Your brand identity includes your logo, font, brand colors, and other visual components customers use to recognize your brand. 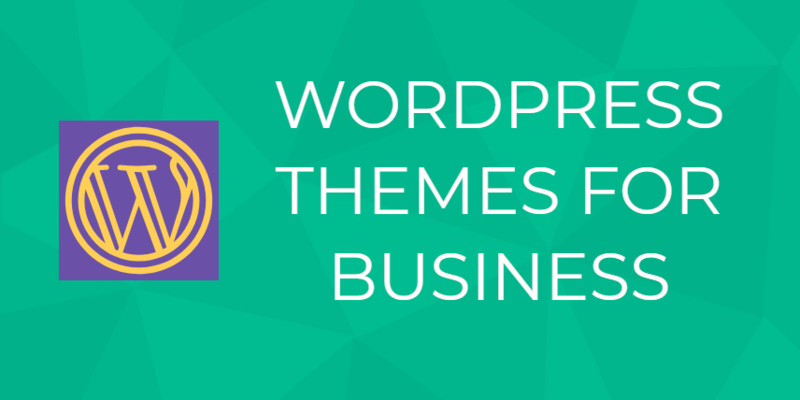 Many business owners choose to hire a designer to create these elements for their business. However, that can get pricey. 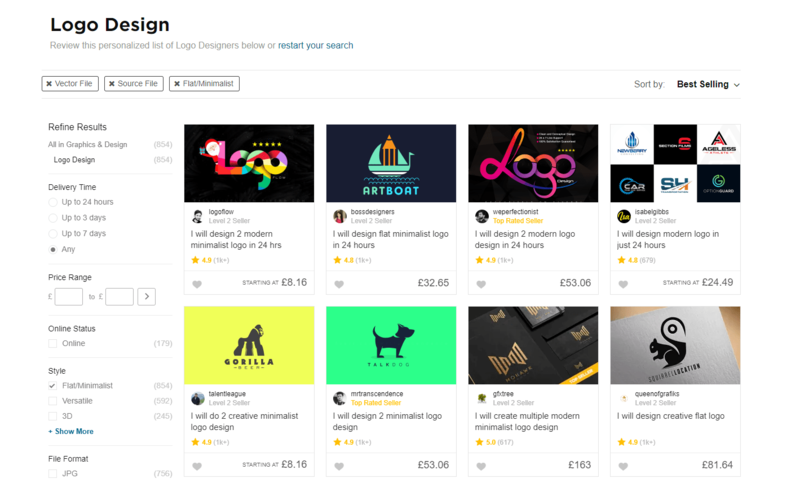 Fiverr offers a customized search depending on your design need and matches you with freelancers. The most important part of creating a brand identity is to be consistent with colors and fonts so customers will recognize your business across different platforms, such as social media and your website. In today’s digital world, most people use the internet to find businesses. 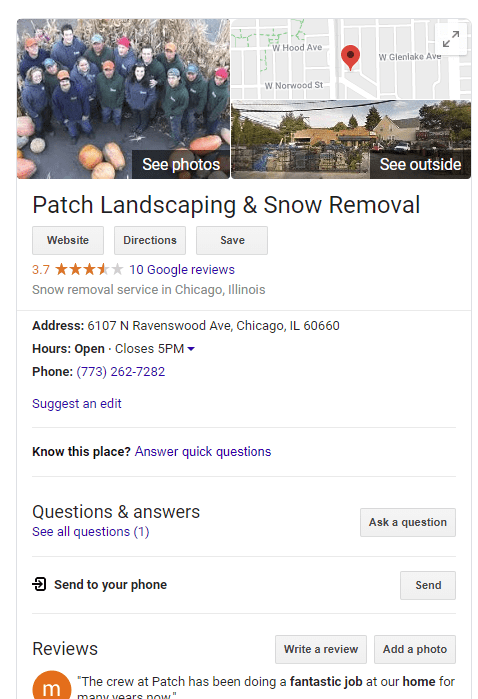 Local search is a powerful marketing tool for small businesses, and research shows it drives traffic. On top of that, when people search for a local business online, they usually want to make a purchase. Building an online presence means your business will show up when people search online. Here is how to do it for cheap or even free. Gone are the days of needing to spend thousands of dollars to launch a website. Using a managed WordPress site and a free domain, you can get your website launched in just a few hours. If you have some funds, you can choose a dedicated domain for just $5 a month. (Meaning you can use www.mybusiness.com versus www.mybusiness.wordpress.com). There are dozens of social media sites, which can get overwhelming to new business owners. Don’t try to be in all places at once. Instead, choose one or two platforms you know your audience uses and focus your efforts there. If you want your business to show up in Google, this is a critical step. Here is how to claim your Google listing. As you can see, starting a small business for less than $100 is completely doable. If you are willing to spend the time to research and learn, you can save thousands of dollars. But, a big part of owning a business is learning lessons as you go–and sometimes those lessons can be expensive. We want to save you from making those expensive mistakes, so here is a list of things you shouldn’t invest money in when you are just getting started. Gazillions of business cards. Instead, buy 25 or so and get more when (or if!) you need them. Branding and logos: Use the tools recommended above to get you started, and then upgrade down the line if you need to. Web development agencies: You can easily build a website for free using WordPress, Wix, or similar website builders. Paid marketing: Use this to grow your business after you are profitable. 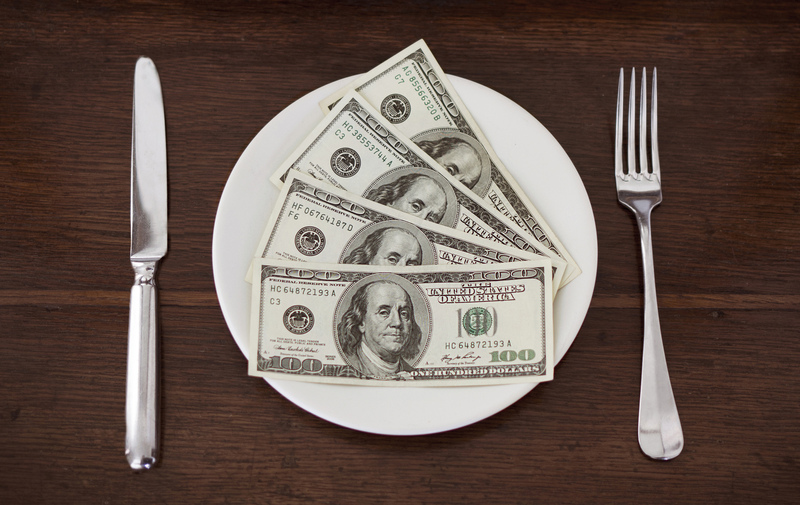 See our guide to Marketing on a Budget. Top of the line equipment: Focus on what you need for right now. If your old Macbook still works, then use it for now. You can upgrade later. An accountant: Instead of spending money tons of money use a service like QuickBooks or Freshbooks to track your expenses. Project management software: Instead, use a free service like Trello, Podio, or Asana. All have limited free plans. Building your own small business is possible, even without thousands of dollars to invest – in fact, you can do it with as little as $100.00 and just a few weeks of time. You can be your own boss, make your own hours, and do work that you truly care about. The suggestions above will help you build a lean business that is positioned to grow. Once you start turning profits, you can invest in strategies to help your business grow. Are you ready to take control of your future? It all starts with creating a business plan, or if you are still in the brainstorming phase check out our big list of business ideas here and use our Launch Your Business in 14 Days free downloadable PDF guide and calendar and get started today.